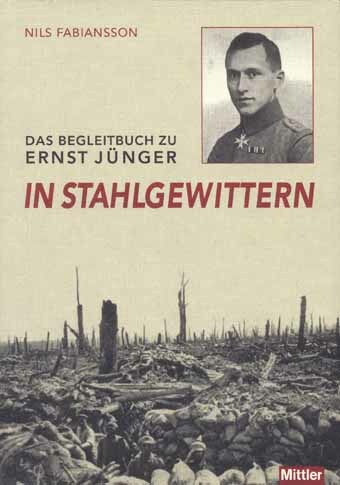 The German war cemetery in Cambrai is slightly off the Jünger-track, but is very interesting because it is in Cambrai, where Jünger stayed several periods. It is also very interesting because there are several German remaining memorials from the actual war period in the cemetery. Most memorials at the former Western Front today have been erected by the British or French after the war (still today memorials are erected along the front). However, all along the front German memorials were erected during the war, often made of stone or concrete. 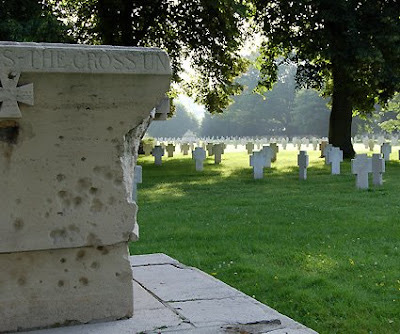 Many of these have been destroyed since then, but the memorials in the Cambrai war cemetery are preserved, although with dramatic traces of war - the whole town was destroyed in the Allied offensive late 1918. The headstones however, are from the late 1970s. The memorials commemorate not only German fallen but French and British. 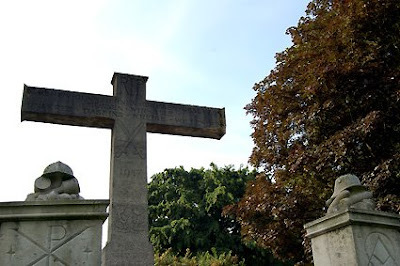 The architect of the memorials built in 1917 was Prof. Dr. Wilhelm Kreis, who after the war was one of the founders of the German war grave association Volksbund Deutsche Kriegsgräberfürsorge e.V. There are 10.685 German, 502 British, 192 Russian and 6 Romanian burials at the cemetery.